By Gerald M. Lemole, M. D., Dwight L. McKee, M. D., Oz (foreword by) and Palev K. Mehta, M. D.
Amazon.com description: Product Description: After the intense experience and range of emotion that comes with surgery, radiation, or chemotherapy (or all three), cancer patients often find themselves with little or no guidance when it comes to their health post-treatment. 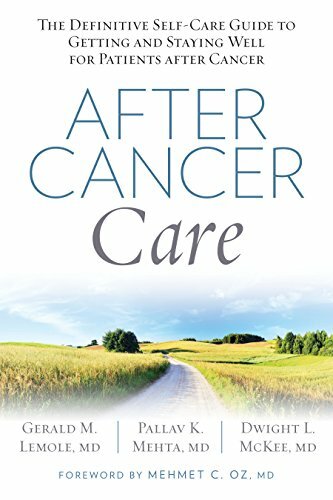 After Cancer Care is the much-needed authoritative, approachable guide that fills this gap. It includes information on how to maintain physical healthâwith chapters on epigenetics, nutrition, and exerciseâas well as emotional health through stress management techniques. The cutting-edge and growingly popular science of Epigenetics has shown that you are not stuck with your genetic history: your choices in diet, exercise, and even relationships can help determine whether or not your genes promote cancer, and therefore determine your propensity for relapse. Your lifestyle has an effect on the most common types of cancer including breast cancer, prostate cancer, melanoma, endometrial cancer, colon cancer, bladder cancer, and lymphoma. The doctors present easy-to-incorporate lifestyle changes to help you âturn onâ hundreds of genes that fight cancer, and âturn offâ the ones that encourage cancer, while recommending lifestyle plans to address each type. In addition, they share 34 healthy recipes and tips on staying active and exercising, detoxifying your house and environment, and taking supplements to help prevent relapse. With more than three decades of post-cancer-care experience, Drs. Lemole, Mehta, and McKee break down the science into palatable, practical takeaways so that you can drastically improve your quality of life and enjoy many years of cancer-free serenity. About: After the intense experience and range of emotion that comes with surgery, radiation, or chemotherapy (or all three), cancer patients often find themselves with little or no guidance when it comes to their health post-treatment.